Venue: Adarsh Crystals No 16/3 2nd floor Cambridge Layout Ulsoor, Bangalore. Brought to you by Square Yards. Located on Sarjapura-Attibele Road, Golden Arena, a flagship project of Aryan Hometec is close to major IT hubs and industrial estates including the proposed Infosys SEZ and will have direct access to the 300 ft STR road. Golden Arena offers an unique oppurtunity to earn assured rentals post possession(a minimum of Rs 10,000 per month for a 633 sq ft flat). With an easy subvention payment which requires an investment of only 5% of the apartment cost, this project is designed to get greater returns for investors. 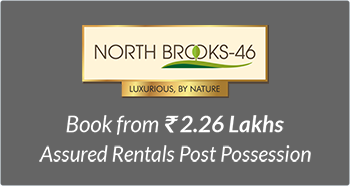 North Brooks 46 is a hub of waterfront residences offering a panoramic view of the beautiful Veerasagara Lake in Yelahanka, Bangalore. Located in a vicinity already dotted with Tech Parks, prestigious educational institutions and world class healthcare providers, it is touted to become the heart of North Bangalore. Which means, your investment here is sure to multiply exponentially.